Thank you all, I am glad you are enjoying my little project. I've nearly got 500 painted miniatures, which seems to equate to 100 a year. Not a great effort. @wrgmr1 Thank you for that little tid bit. I will check it out as I have never dabbled in artist mediums before. Getting more basing done, and putting the finishing touches on my first cavalry units for my Allied contingent. 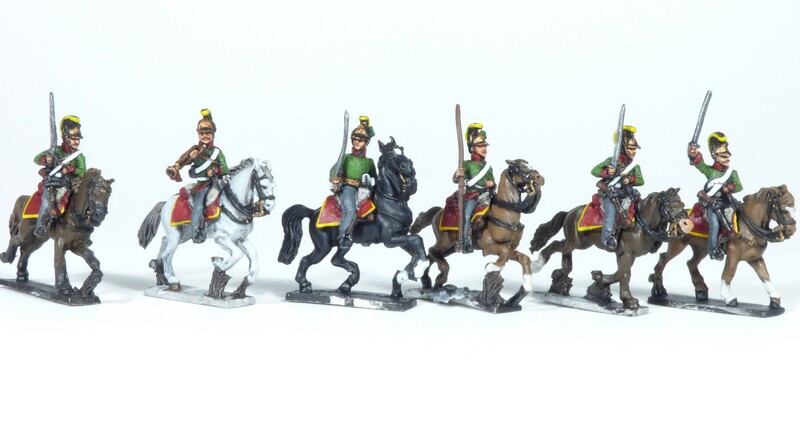 This time some aforementioned Württemberg cavalry. Really pleased with how these fellows turned out. 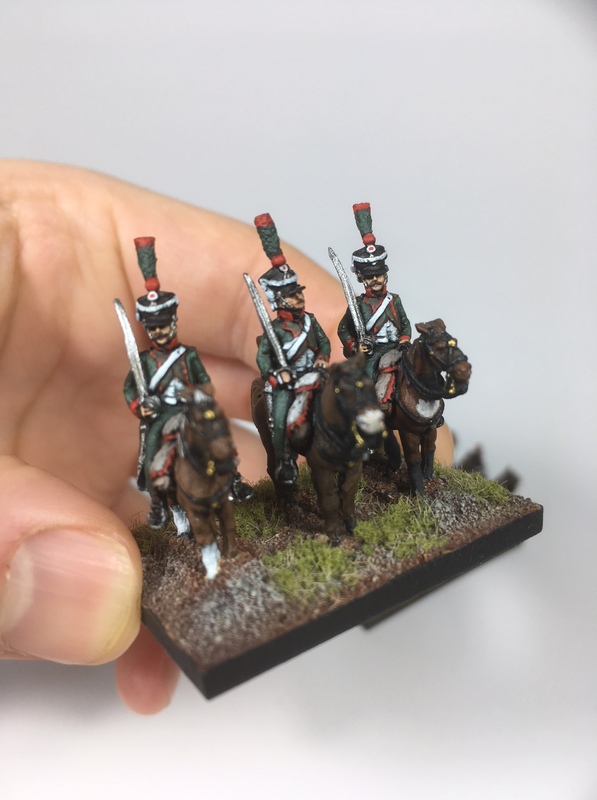 I am getting very itchy to paint some french line, or some proper heavy cavalry but my dogged determination to finish a unit keeps me on track. However, I am thinking it maybes stifling my approach. Anyone got some ideas they could share on how they approach painting big battalions? More tiny toy soldiers. This time the finished version of my French light horse. I have finished my first full allied division, a Bavarian one, which I shall post later on this week. Happy days - the slow slog continues. They look really nice! Neat painting, steady hand, well done! Cheers! Beautiful stuff. Love those AB figures. For big battalions (or 15mm Naps in general) I always try to combine all the identical poses together in a line on a stick and use bit of an assembly line method for painting. Starting from one direction I add 1-2 brush strokes to every single mini in a line and then proceed onto the next brush stroke. That way you don't waste time turning the minis around and you can be sure you don't forget to paint something on a single figure. In general I feel a good amount to paint in a single pass would be one where you don't have to turn the mini around at all and where you don't need to take more paint into your brush before you are done with the whole row of miniatures. I find that painting for example all the white in a single mini takes a lot longer overall and I easily forget to paint some area in a few of the minis forcing me to go back and do touchups. One important thing to remember when painting in an assembly line fashion is to think through the painting order before you start. I like to paint from the inside out to minimize any risk of making a mess and having to do cleanups. Also minimizing the colour palette helps (for example I use the same for wood and brown leather even if in reality they were a bit different) For example on my Saxons the general paint order is Skin -> Facings -> Brown parts (gun, backpack, brown hair) -> Grey parts (overcoat, some pants for variance) -> black parts (shoes, cartridge pouch, shako, black hair) -> metals -> white uniform and equipment -> wash -> highlights in the same order as before. 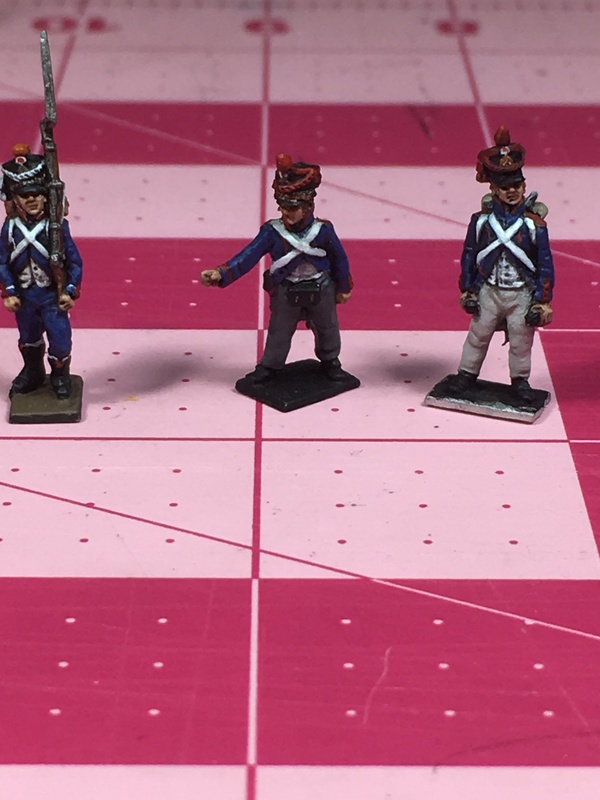 Although miles apart, I may say that I used the same painting method, especially when painting my 10mm ACW North and South. It is efficient, but you need muuuuuch patience, something that I wish you to have until the completion of your wonderful project! Thank you for the detailed explanation and the time you took to provide it. Very much appreciated. I tried to follow it to the letter when I worked on some Austrian dragoons, but I kept getting distracted by wanting to straighten this up, and highlight this, and fix this and etc. The patience and perseverance to continue with one stage of the process is a learnt and practiced skill. I commend all who can do it. But I'll keep at it. @DintheDin, thank you for your encouragement. Sometimes my pedantry gets in the way of enjoyment, but I suppose that is part of my hobby. I've recently finished some Jäger, which I tried to batch paint but ended up detailing individually - in detail! The grey was built up from black. This was not a good idea. I should started with a mid grey undercoat. Oh well, Always learning. Very lovely postures and your paintjob is outstanding! Neat painting once more and the faces well done! Cheers! Working in an assembly line fashion certainly takes a lot of dedication and patience. I've more or less given up on it outside of 15mm minis as it's just too tedious. Nothing seems to happen for a long time when you're doing the same stuff on a ton of figures at the same time. Music and settling down for maybe 2 hours of painting and then doing something totally different really helps me stick to the dull routine painting. More figures, and this time with an attempt at producing decent photographs. Though, I feel I am a little off still. 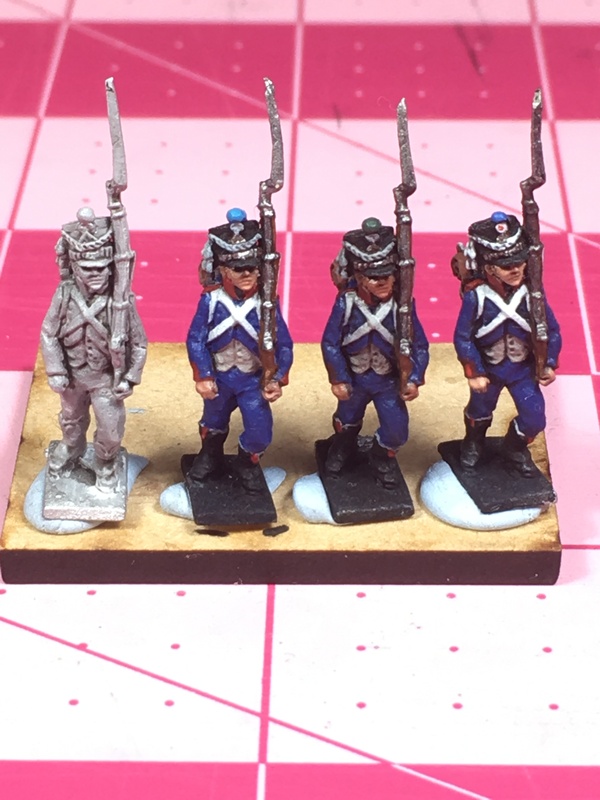 Here are some Cheveauxlegers I am working on. I have used VMC Panzer Series Uniform Green for the green on the uniforms, which is very bright and collectively standouts from the rest of the Austrian army. Again, these are fantastic models but I am much more attracted to the "standing" poses for my light and medium cavalry. 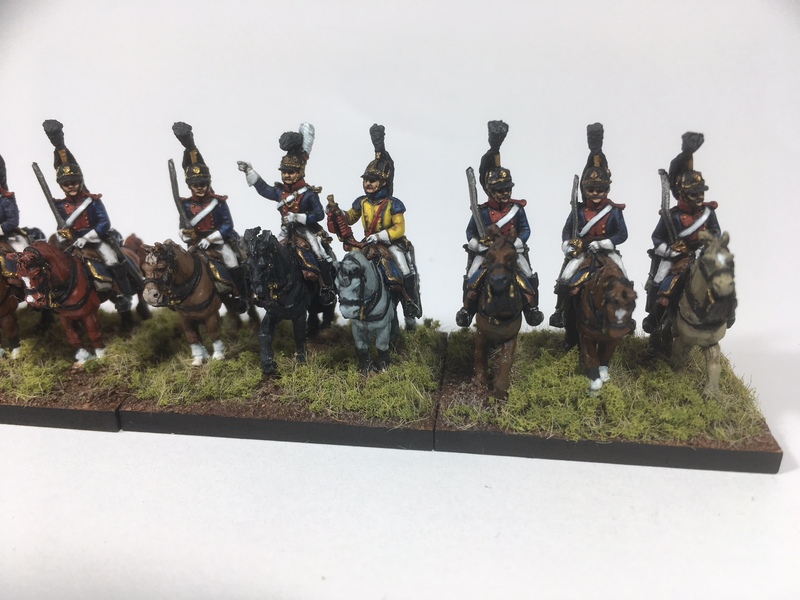 The heavies I mount on horses at a trot and I can not wait to get started on the Cuirassiers for both the French and Austrian armies. If anyone wants a unit commissioned feel free to PM or visit my blog site. Just an addendum to an earlier post: I use Liquitex artist acrylics any chance I get, but they have a limited range of colors. With a small bit of threadomancy we are back up and running. Apt really, just like the Habsburg army, it rallies when you think its dead. To continue on with my slow but inexorable push towards having a collection one day, here I present some French WIP. I hope these inspire, or at least help fill the void between gaming and painting. I do this sort of thing to properly detail the way I shall paint the figures, and then jot down my method in a copybook which I keep alongside my paints. 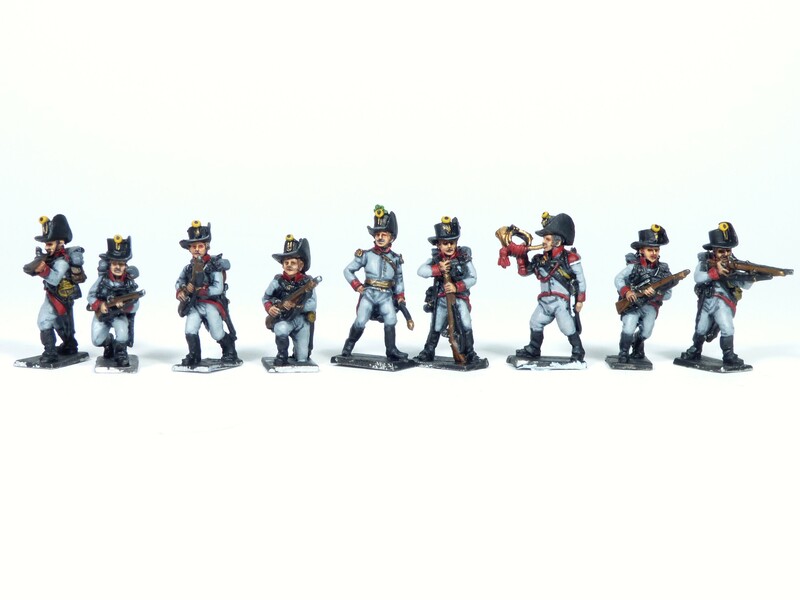 A few completed test figures both Light Infantry and Artillery. They are coming out very nice! Ah! The Uhlans are splendid! AB makes excellent sculpts, and, in the hands of a good painter they become a sight to behold! Thank you, Din. Much appreciated. The Uhlans are a joy to paint and a welcome relief from march attack posed. Thought I would share some figures I painted for someone else! I worked on these in May and June, pulling together a small force of Austrians for 1809-1813. The Infantry were in the shako, which was a welcome change. I'll soon post some of my own collection.